HAproxy is a good example of OpenSource reverse proxy load-balancer with content switching capability. cache server: a server able to quickly deliver static content. Squid, Varnish and Apache Traffic Server are OpenSource cache reverse proxy. application server: the server which build the pages for your news website. All the traffic pass through the Aloha load-balancer. 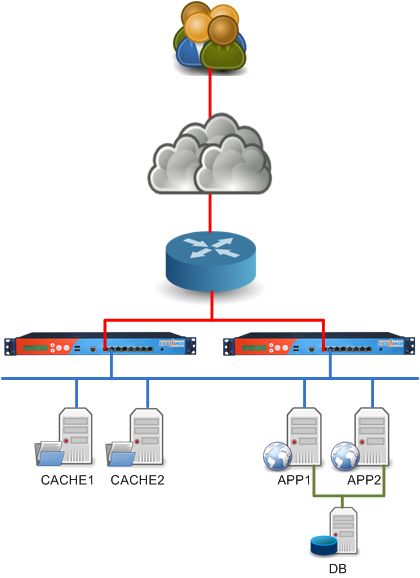 HAproxy, the layer 7 load-balancer included in Aloha, will do the content switching to route request either to cache servers or to application servers. If cache server misses an object, it will get it from the application servers. The content switching is achieved by the few lines beginning with the keyword acl. If a URI starts with /user or /profile or if the method is a POSTthen, the traffic will be redirected to the APPLICATION server pool, otherwise the CACHE pool will be used. We maintain backend server persistence using the cookie sent by the application server, named PHPSESSID in this example. You can change this cookie name to the cookie provided by your application, like JSESSIONID, ASP.NET_SessionId or anything else. Note the health check URL: /health. The script executed on the backend will check server health (database availability, CPU usage, memory usage, etc…) and will return a GOOD if everything looks fine and a WRONG if not. With this, HAproxy will consider the server as ready only if the server returns a GOOD. Here, we balance requests according to the URL. The purpose of this metric is to “force” a single URL to always be retrieved from the same server. In order to lower the impact of the Vary: header on Content Encoding, we added the two lines reqidel / reqirep to normalize a bit the Accept-Encoding header. This entry was posted in Aloha, layer7, optimization, performance and tagged cache, content switching, haproxy, infrastructure, url hash, webperf. Bookmark the permalink. Thx! A small addition which may be obvious for most of the people but took me some time to figure out: For content switching both the frontend and backend need to be in the same mode. It worked for me after adding “mode http” to the frontend and backend definition.